Charles W. Chesnutt Library celebrates Black History Month with a book talk featuring FSU author, Kelisha B. Graves. 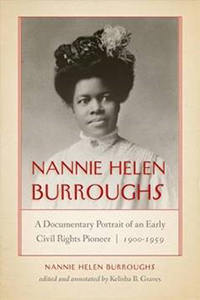 Join us on February 12, 2019, at 2:00 pm at Chesnutt Library as Ms. Graves speaks about her book: Nannie Helen Burroughs: A Documentary Portrait of an Early Civil Rights Pioneer, 1900-1959. Nannie Helen Burroughs, was an African-American educator, orator, religious leader, civil rights activist, feminist and businesswoman in the United States. Her speech "How the Sisters Are Hindered from Helping," at the 1900 National Baptist Convention in Virginia, instantly won her fame and recognition. Ms. Graves is an Academic Excellence Counselor/Freshman Seminar Instructor in the FSU Honors and Undergraduate Research Programs. She is also Advisor to the FSU Black History Club.